PLAIN TWP. It was one of those nights at Bob Commings Field on Friday night. It was a night where almost everything went right for Massillon, and everything went wrong for GlenOak. When it was all said and done, it was a night where the Tigers posted their biggest margin of victory since Week 5 of the 2016 season in rolling to a 49-0 win over the Golden Eagles. 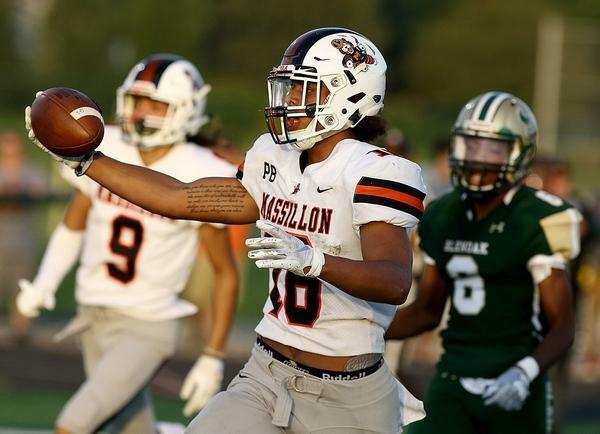 Massillon, 2-0 for the first time since 2014, had all of it on display in its biggest win since a 75-7 beating of Toledo Bowsher. The Tigers ran it, they threw it and they stifled GlenOak at every turn. And that was just in opening up a 35-0 halftime lead. The Tigers’ big night started with their big running back Thomas powering his way to 170 yards on 11 rushing attempts. All of those were in the first half, as he also ran for three touchdowns of 35, 53 and 49 yards. The first two came on Massillon’s second and third possessions, giving it a 14-0 lead. The third came on the first play of the Tigers’ fifth drive, making it 21-0 less than two minutes into the second quarter. Thomas was just part of the Tigers’ rushing tandem that gained 254 yards in the first half and finished with 343 yards for the game. Zion Phifer, while he wasn’t able to get into the end zone, added 106 yards on eight carries. Meanwhile, Aidan Longwell added four more touchdown passes, giving him seven on the season. 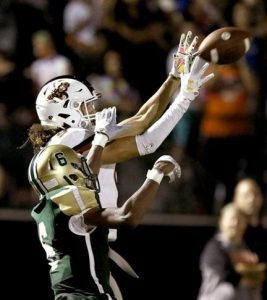 He hit Aydrik Ford on scoring strikes of 35 and 46 yards, while tossing 18- and 17-yard scores to Jayden Ballard. The final one to Ballard came on Longwell’s last pass of the night, giving the Tigers a 42-0 third-quarter lead. Longwell finished 8-of-13 for 151 yards with the four scores, but two other interceptions in the end zone. 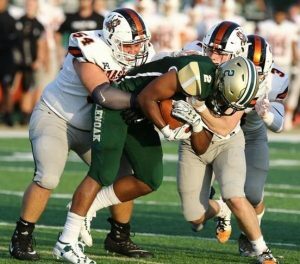 GlenOak, which suffered its worst loss since a similar 49-0 setback at McKinley in Week 4 of the 2005 season, is hoping to bounce back from consecutive tough Friday nights against potentially two of the best teams in the state. The Golden Eagles are 0-2 for the second consecutive season after setbacks to first Toledo Whitmer and now to Massillon. It was a bit of injury thrown on top of insult, however, on this night with the loss of Richardson. The dynamic junior quarterback suffered what appeared to be a leg injury on GlenOak’s third series of the game after being sacked.